Home Physical Characteristics Praying Mantis Eyes – How Many Eyes does a Praying Mantis have? 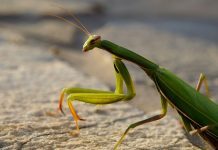 Praying Mantis Eyes – How Many Eyes does a Praying Mantis have? Unlike most other insects praying mantis has bulging eyes which are attached to their triangular heads. 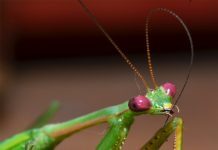 The mantis’ eyes are supported on its flexible neck. Praying mantises have five eyes out of which three are simple while the other two are compounds eyes. There are two tiny black spots inside the mantis’ eyes which moves as the mantis rotate. These black spots are known as pseudopupil. 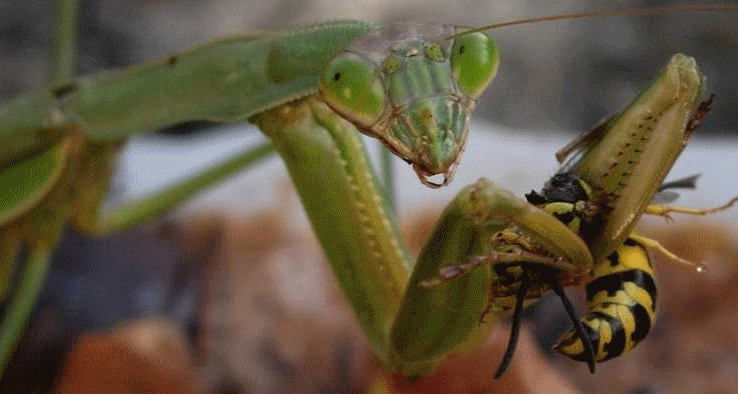 You might like to dig deeper into the functioning of the praying mantis eyes aren’t you? Mantises are ambush predators. They rely on sight to hunt live animals. Thanks to their remarkable compound eyes which contain 10,000 ommatidia, the mantis can find just about any prey moving into the grass. However, only the front portion of the mantis’ eye creates a high resolution image. This portion is called ‘fovea’. Mantids can only see moving objects because of ommatidia. The ommotidia doesn’t appear to focus still images. The area within the eye (other than the ommitidia) does also play a key role in rolling out images. If a mantis recognizes a prey it then moves its head to get the image into the high-resolution-area of the eye which is fovea. If you take a closer look at a mantis you’ll see that the two eyes of a mantis are widely placed perhaps for a good reason. The unusually wider eyes allow the mantis to have an extensive binocular field of vision one that creates a stereoscopic vision. It won’t be wrong to assume that mantises have binocular single vision—at least with respect to the direction of prey in space. We humans can see objects in three-dimensional picture of the outside world but mantis seems to be more interested in focusing its prey only—leaving the rest of the scenery blurred. We humans can see objects in three-dimensional picture of the outside world but mantis seems to be more interested in focusing its prey only—leaving the rest of the scenery blurred. This was believed to be true until recently when a team at the Neuroscience at Newcastle University (2018) proved it all too wrong. 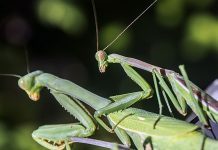 They studied the praying mantis’ eyes and concluded that mantises might just have the same kind of three-dimensional vision as we humans have. Praying mantises are almost entirely diurnal because they use their excellent sight to hunt prey. 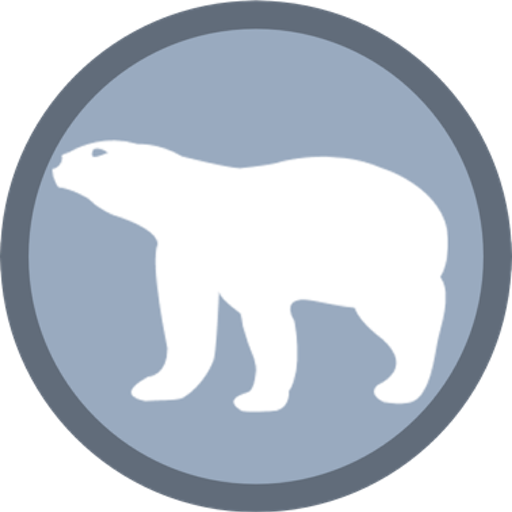 However, there are a few species that become active at night possibly responding to the artificial street lights. They don’t launch an attack straightaway. Mantises are sit-and-wait hunters. If a prey moves somewhere around the mantis then the mantis inspects it using forvea. The inspection is over however if the prey is few inches away from the mantis. The predator immediately attacks the prey using its raptorial forelegs. Simmons, Peter J.; Young, David (1999). Nerve Cells and Animal Behaviour. Cambridge University Press. p. 8990. ISBN 978-0-521-62726-9. Rossel, S (1996). “Binocular vision in insects: How mantids solve the correspondence problem”. Proceedings of the National Academy of Sciences of the United States of America. 93 (23): 13229–13232. doi:10.1073/pnas.93.23.13229. PMC 24075. Howard, Ian P.; Rogers, Brian J. (1995). Binocular Vision and Stereopsis. Oxford University Press. p. 646. ISBN 978-0-19-508476-4. 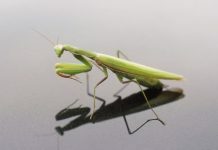 Is a Praying Mantis an Insect? How Big is a Praying Mantis?